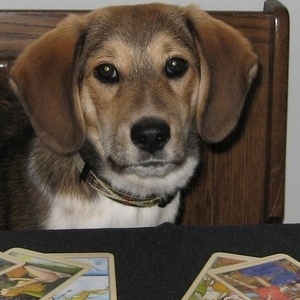 Tarot Reading for Pets and other companion Animals began as somewhat of an original and inspired “whim” sometime back around 2005. While communicating with Animals, and realizing how similar their thoughts and emotions were to us, I decided to try a little experiment - a Tarot Reading for an Animal. With the first reading, I knew a star was born as the results were nothing short of miraculous! Being an Animal Communicator, I was able to see the accuracy of the readings very quickly. The Tarot cards reflected the Animal’s thoughts, emotions and energetic situation, just the same as would a reading for their human counterparts. You see just like us, Animals are sentient beings. They want and need to have an emotionally fulfilling life - experiencing happiness, joy, excitement and yes, even have some fun adventures just like we do! If they don’t have this variety or stimulation, again like us, they can easily get bored, frustrated, lonely or even worse - severely depressed. When this happens, you may notice changed, odd, or even problematic behavior, having no idea why. This is where a Tarot Reading for your beloved Pet or Companion Animal can be extremely beneficial. A Tarot Reading for an Animal can be illuminating and highly therapeutic, assisting in revealing your Companion’s state of mind and the issues that are important to them at the time of the consultation. The Tarot acts as a wonderful counseling tool, helping you - their human - to gain insight into the mind of your Animal Friend. By getting to the heart of any matter, a reading enables you to take action and ensure your cherished Companion is mentally healthy, happy and enjoying life! Is there something in particular you would like to know about your beloved Companion? The Tarot can also be consulted for specific questions and situations. For example: perhaps you would like to know how your pet is feeling about a new Animal or member in the household. Or, maybe your Companion is a rescue and you would like to know if they are happy in their new home. The possibilities are endless. An Intuitive Tarot Reading can be an extremely enlightening and uplifting experience. Highly therapeutic in nature, the Tarot helps you take a look at the general undercurrents and invisible forces at work within your life at the time of the consultation. As a result, the intuitive reading acts as a counseling tool, helping to shed light on any problems or concerns you may be having about relationships, relocation, career or financial decisions. In some cases, it can even aid in revealing your spiritual path and purpose. While the Tarot does not actually predict the future – it does work by showing you various probable outcomes depending on your own free-will and choice of action. By enabling you to gain a greater understanding of yourself and the energies in play around you, Tarot can be of great assistance in your decision making. Thus, an Intuitive Tarot Reading will empower you to make better and more informed choices that will lead to a happier and more fulfilling life. **Would you like to learn how to do your own professional Tarot Readings for Pets and companion Animals, Friends, or perhaps yourself? Click on the link to my Intuitive Tarot Courses and discover how you can learn the magical art of Intuitive Tarot Reading for Animals and People.